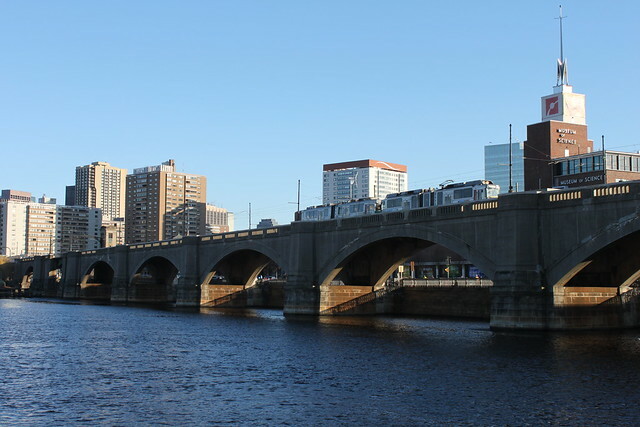 A Boston Green Line train crosses the Charles River into Cambridge. Photo by flickr user joseph a. Despite an impending $160 million hole in this year’s budget, the Boston-area transit agency MBTA is moving forward with a $1 billlion project to improve and extend its iconic Green Line. That project won’t add to the agency’s debt, an agency spokesperson told the Boston Globe, because the funds are coming from state and federal sources. When finished, the Green Line light rail line will be extended roughly five miles from its current terminus in Cambridge to West Medford. The extention will bring 7 new stations and better service to a corridor that is presently served by an infrequent commuter rail service. New BART cars spark outrage over cost and outsourcing — but at least BART’s getting more bike lockers! In previous transit roundups, we’ve highlighted renderings of the sleek new trains that Bay Area Rapid Transit plans to buy to replace its aging fleet of cars, many of which date to the systems opening in the 1970s. But there’s a major downside to replacing old with new in this case. You see, many key features of the BART system were designed to non-standard specifications. Most significantly, decision-makers early on elected to use tracks that have a 5’6″ gauge (the distance between the rails) instead of the 4’8.5″ “standard gauge” used in most of North America and Europe. Thus, not only will the new BART cars have to be built custom from scratch, but the machines that make them will need to be made from scratch too — which is unsurprisingly expensive. So much so that the Huffington Post reports that bids from prospective manufactures are coming it at four times what New York Metro paid for its latest trains. Not all the transit news in the Bay Area is a bummer, however. BART announced via its official blog that the agency has installed over 300 new electronic bike lockers at 19 stations, roughly doubled their number system-wide. Nestled between Washington D.C. and Baltimore, the affluent county of one million residents is grappling with frustrating traffic and what to do about it. In an effort to expand alternatives to driving alone, the County Council voted in favor of creating a 150-mile network of BRT service — which would feature bus-only lanes along busy corridors — instead of going with light rail. Their reasoning: More BRT service could be deployed over a larger area for the same amount of money as would be required for a more limited light rail system. Ben Ross at the Greater Greater Washington blog laments, however, that the county’s department of transportation seems disinclined to support bus-only lanes at busy intersections, even though that would move more people, faster than the current free-for-all configuration. A plan called “Grand Boulevard” would turn El Camino Real — a main artery between Palo Alto and San Jose — from a six-lane auto-oriented highway into a multi-modal corridor featuring BRT and bike lanes. But it looks like Mountain View’s elected officials are uninterested in participating. The Mountain View Voice notes that the city council voted 4-2 at a recent hearing to oppose BRT on its four-mile stretch of El Camino Real, over strong support from a majority of public speakers and from the city’s former mayor. Projections from the Santa Clara Valley Transit Authority (VTA) suggest that BRT would improve end-to-end trips along the 17-mile corridor by roughly 20 percent — making a 67-minute trip just 52-minutes. Salt Lake City has been hard at work expanding its rapid transit network — as we explored in this piece — thanks to a dedicated local sales tax. But an audit by the state legislature has raised a red flag and an important question: does the agency have enough funds to finish building those lines and then operate them? The Deseret News reports that agency officials are confident that the economy will rebound enough in the next few years to improve their revenues, but are preparing contingency plans to fund the new light rail and commuter rail lines that will come online in the next few years. For reference, Measure R and other local funding sources will cover the operating costs of new Metro Rail lines. Categories: What's happening at other transit agencies? Actually BART uses tracks that are 5’6″ wide (1676mm) which just so happens to be the “Indian Gauge” used in Pakistan, India and Myanmar/Burma today. The reason that I have read as to why the planners of BART did not use “four-foot-eight-and-a-half” (1435mm, see how much easier metric is?) is because they were convinced that they were building a system that would outlive the end of the railroads and could very well have been the last rail transit system built in North America. The future of automatic flying cars was coming very soon in 1968! As for the “New York Metro”, is it possible that their fleet is cheaper because A) they buy so many more cars at a time, B) they stagger purchases so as to be refreshing their fleet all the time, and C) they end up with a far more “bare bones” car than BART will. Note that Boston’s MBTA is also looking to alternative fare structures (distance based princing). Take a hint, Metro; flat rate fares don’t work. The wider BART gauge, iirc, was because the initial design included trains crossing the Golden Gate and Richmond bridges, which get cross-winds of 80mph. One day the cost of new custom cars will be higher than the cost of ripping out the rails and replacing them…. which makes it a shame that it doesn’t get done now before the South Bay extension is built. Thanks Todd, I forgot about the branch to Marin County. What I don’t get is, why would having a non-standard truck/bogie add cost? There are plenty of non-standard gauge rail vehicles in North America (Toronto, Philadelphia and Pittsburgh Light Rail come to mind), and few systems, especially high-platform heavy rail, can actually buy a vehicle that isn’t tailored to them.